Code editors are usually encumbered by other complicated tools and add-ins, such as compilers, libraries and many other plugins designed for large projects. But if you only need to view and modify a few source code files at a time, all the other utilities only serve to slow you down and complicate your task. The application can automatically detect the language used throughout the document and adjust its highlighting settings to fit the available commands and arguments. You can also insert comments into the code using the dedicated button, which transforms the selected text into a comment block. If you happen to get stuck on a word you do not understand, BowPad Portable enables you to search for it on the Internet or directly on Wikipedia. Although this does not happen in the application's own interface, since it needs to open a separate browser window, it is still faster than performing the search manually. You can create bookmarks throughout the code file and jump from one to another at the press of a button, making it extremely easy to navigate large documents. The “Find” and “Go to” functions can also be used to surf and search the file for specific terms and phrases. 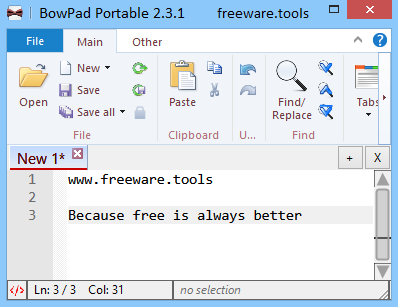 BowPad Portable is a handy utility fit for any coder who needs a simple tool to view and edit various types of source code files. The lightweight and straightforward interface is easy-to-use and does not interfere with your work, allowing you to concentrate entirely on the task at hand.